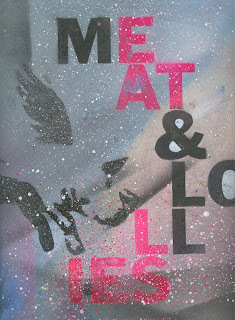 MEAT & LOLLIES: Pigs can fly!! Hi guys I hope everyone is doing good!! Well this is my stuff that I've been working on. Just some rough ideas of what I want to do for this show and all I'm doing is responding to the theme 'Meat & Lollies.' 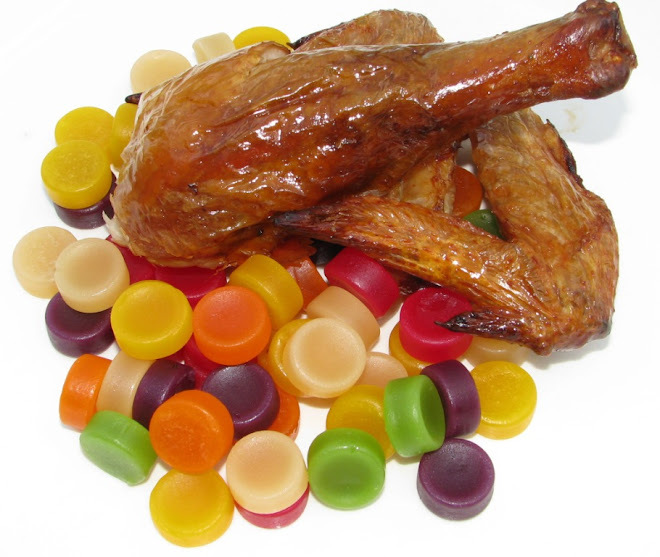 For me Meat & Lollies is basically food that Pacific Islanders love to eat so my work has some parody in it and I definitely don't want to be all serious about it and take the arty farty approach. At first I really didn't know what to do and where to start so I just started with the obvious - the theme: Meat & Lollies. Not far from work is a cool Chinese restaurant where I eat my pork on rice for lunch. They have duck as well but man the pork on rice is the best!! I would go there and they know straight away what my order is - 'pork on rye' (thats what it sounds like to me). Sometimes I have wontons and they always ask if I want to order some. Well anyways that was me everyday pork on rice for lunch. Now I eat subway for lunch and I'm eating the Veggie Delight sub - its pretty good. My workmate is a vegetarian and to be honest I don't know how they do it. We would talk about what kind of food we eat, why we eat it and all that stuff. Haha its funny cos I don't think I can live without meat. I'm a P.I and thats just apart of who we are - we are MEAT EATERS!! But eating healthy once in a while is cool and I told my mate that I won't have my pork on rye everyday now hehe!! 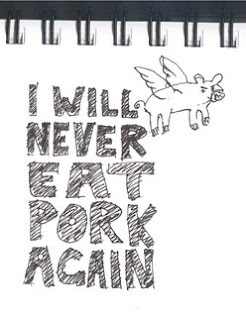 So thats how I came up with 'I will never eat pork again.' I was thinking about pork and saying to myself I will never eat pork again over and over. The more I said it, the more I knew I was lying to myself. So I scribbled the phrase in my book and drew a flying pig as to say: look at me I'm a flying pig! !